My wife and I attended a party last Saturday night…an Annual End of Summer Turkey Fry. It was a wonderful party hosted by our friends Joe & Linda and as usual the party was a huge success. As the enthusiastic crowd lined up with their plates to sample some of the 16 turkeys (yes, I said sixteen!) it didn’t take long to notice that the one poor guy that was carving and serving as fast as he could, was very quickly getting deep in the weeds. Well, as any food lover worth his salt would do, I sprung into action, grabbed a knife and proceeded to help break down my fair share of the steaming hot birds. By the time the dust settled and the lines had dwindled down we had carved 13 turkeys. Both the cook and the gracious hostess insisted that the carvers “must” take home some of the leftover turkey…so who am I to refuse leftovers? I ended up bringing home a whole 12 lb bird plus a jambalaya pot full of scraps. Why all this turkey talk in a post about pork? Well, that was Saturday, and by Wednesday night we had eaten turkey gumbo, turkey with rice & gravy, turkey panini, and turkey hash (with poached eggs of course!). After turkey for lunch and turkey for dinner for four days straight, by last night I was ready for anything but turkey…I was ready for some pork! Char siu, in Chinese, translates to fork burn (or roast). Interestingly the word Char actually means fork and siu, to burn or roast. This is the same “roast pork” that is often used in egg rolls, won-ton, fried rice, and myriad other ways in Chinese cooking. Traditionally it is hung on a hook or fork (Char) and roasted (siu) in an oven or over an open fire. 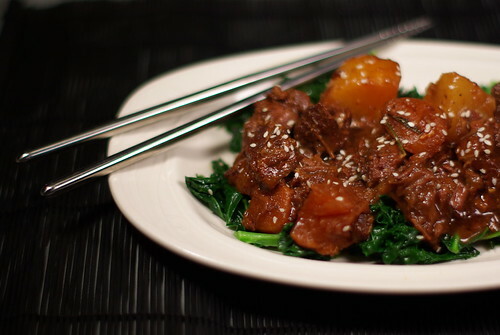 Because this recipe strays from tradition (braised and not marinated for hours) I am calling it Char Siu “Style” Pork. Here in the U.S. much of the Char siu that I have eaten has been dry and oftentimes chewier than I prefer, so for this recipe I set out to come up with something a little more juicy and tender. I decided on braising because this cooking method has been working very well for me with the leaner boneless pork country style ribs. Because I didn’t have time for a true marinade, I felt the braise would infuse the flavors most deeply in the shortest amount of time. Would I recommend using this same recipe and marinating the pork overnight? Absolutely! I probably will do exactly that the next time around. But, for the relatively short (two hours overall) cooking time that I had, I think I was able to produce a reasonable Char Siu “Style” pork. It tasted right, was moist and quite tender and I was happy with the results. And, it wasn’t turkey! Of note: This pork would also be quite good finished on the grill instead of the final uncovered baking. Look for the bean sprouts to be hot, with a little browning on the outside, but still crispy on the inside. You don’t want them to be limp. If you like a little heat try adding a tablespoon of sliced bird (or Thai chili) peppers at the same time as the green onions. Pre-heat the oven to 325 degrees. Line the bottom of a Dutch oven or a large, deep sauté pan with the sliced onions. Add the Shaoxing wine and bring to a mild simmer over medium heat. 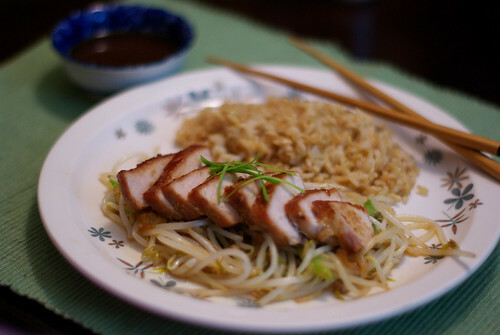 Combine the Hoisin sauce, soy sauce, agave nectar, fish sauce, toasted sesame oil, garlic, and ginger in a mixing bowl. Stir until well incorporated. One at a time, dip each rib into the sauce mixture to coat, then nestle them onto the bed of onions already in the pan. Place the remaining sauce in the refrigerator for later use. When all of the ribs are coated and placed evenly on top of the onions, cover the pan firmly with aluminum foil before placing on the lid. Bake at 325 for 1-1/2 hours. After 1-1/2 hours remove the ribs from the oven. Carefully remove the lid and the foil and then “very” carefully pour off most of the liquid (reserving the liquid for later use). Brush the remaining sauce mixture on the ribs and return them, uncovered, to the oven for 30 minutes more. Remove the ribs from the oven and allow them to rest while you prepare the bean sprouts. Heat a wok (or sauté pan) over high heat until very hot. Add the oils, shaking the pan to distribute. Add the green onions, garlic, and ginger and cook stirring constantly for 30 seconds. Add roughly 1/8 cup of the reserved cooking juices from the pork, then the bean sprouts and cook stirring constantly for 1 minute. Let this sit 30 seconds without stirring then remove from heat. That’s it…You’re ready to serve! Place about a one cup serving of the bean sprouts on the plate then fan sliced rib meat even on top. Garnish with (roughly) 1” pieces of julienned green onions and serve with a little of the cooking liquid as a dipping sauce. What a busy week it has been! Kat cooked on Monday, we were out with friends for Vietnamese food on Tuesday, Wednesday I had the good fortune of being invited on a fishing trip, and Thursday it was pizza with more friends. Here it is Friday already and I haven’t cooked all week…it is a good night to stay in, have a quiet dinner, and perhaps watch a movie. Getting back to that fishing trip; I think the warm weather here has the fish a little confused. We were out on the ocean from sunset until midnight and I only brought home 4 little fish. But fresh fish is fresh fish so I wanted to make the most of it. I knew we were busy on Thursday so I filleted the Snapper, and sealed 4 fillets airtight in a plastic bag, and put them on ice. The other 4 fillets were vacuum sealed and frozen for another day. Fresh fish stays fresh for 2-3 days as long as you keep it cold…ice cold! For my taste, the refrigerator alone is not cold enough and flavor will deteriorate quickly unless the fish is kept on ice. I usually seal fish in an airtight zip lock or vacuum sealed bag then place it in a big bowl of ice. I cover that with another layer of plastic wrap over the top and put the whole thing on the bottom shelf of the fridge. This way, even if the ice melts a little bit, your fish stays nice & cold and doesn’t get waterlogged. Whole, cleaned fish will keep just as well stored the same way. For this recipe I used boneless fillets. To get good browning it is important to that the fish is dry so after rinsing them I placed them on paper towels and patted them mostly dry, then I transferred them to another layer of paper towels and repeated the process. With sprinkling of salt & pepper…they were ready to go! 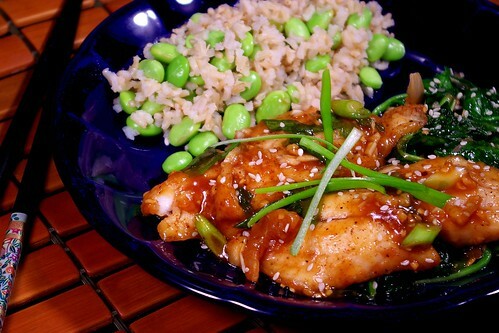 The fish was served over a bed of Sautéed Spinach with Toasted Sesame Oil with Edamame and Brown Rice. Add the soy sauce and ¼ cup wine to a bowl along with the next 7 ingredients, reserve until fish is cooked. Add 1 tsp corn starch and 1/8 wine to another bowl and mix well (this creates a slurry), set aside. Heat a non-stick pan over medium high heat adding the sesame and canola oil when hot. Pat the fish dry, season with salt & pepper and dredge in flour. Shake off any excess flour and cook the fish 2 fillets at a time browning well, about 2 minutes per side. Remove fish to a paper towel to drain. When fish is done, discard any excess oil and add the reserved sauce. Raise the heat to high and as soon as the sauce comes to a boil, remove the pan from the heat and stir in the corn starch & wine slurry. When the sauce begins to thicken, stir in the green onions and sesame seeds. Gently dip each piece of fish in the sauce to coat. Set the fish on the serving plate and spoon on additional sauce before serving.